Lemon and bean quinoa salad is a quick and easy meal that is healthy too! This ancient seed cooks in only 15 minutes. It is packed with protein and high in magnesium and iron. Mix the quinoa with some chopped herbs, beans, a little lemon juice and olive and your done. Feel free to add whatever veggies in the fridge for extra flavor and nutrition. 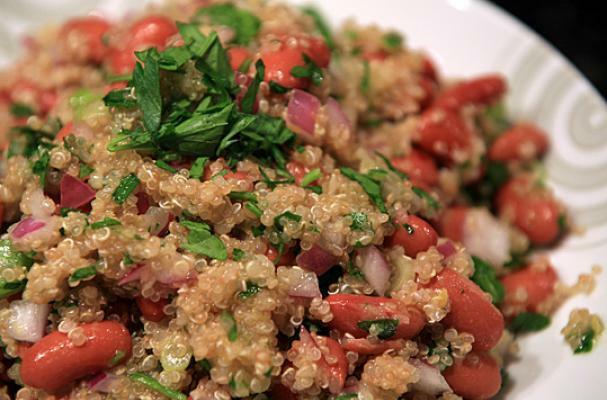 Lemon and bean quinoa salad is a delicious start to 2012. Make your quinoa according to the directions on the package. Remember that quinoa is like any other pasta or grain; be sure to salt the water to season. In a large bowl, mix together the kidney beans, onion, parsley and lemon zest. Strain your cooked quinoa – use a colander with small holes, these little grains are tiny. Pour the warm quinoa into the bean mixture and add lemon juice. Toss to combine drizzling in a touch of olive oil for a glossy finish. Allow 10 to 15 minutes for the grains to absorb the lemon and olive oil and serve in a large bowl.